Piletec lends a helping hammer to a charitable cause. 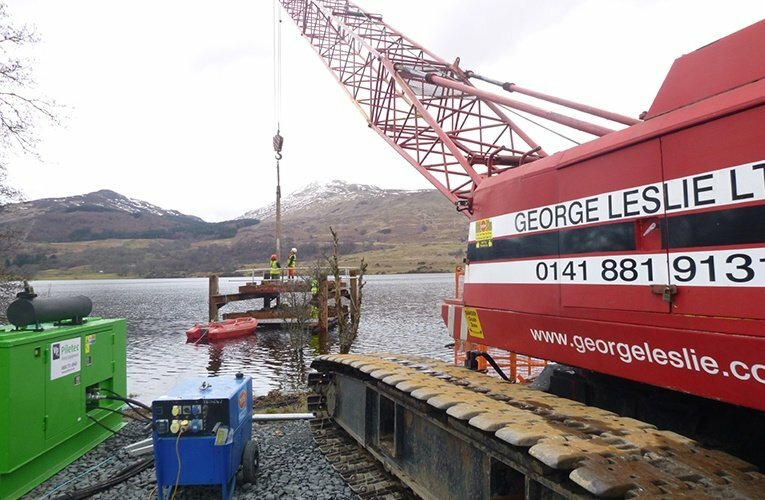 Children suffering from cancer, and their families, will be able to enjoy views of a serene Scottish loch from a jetty installed in a charitable initiative by the Piletec division of Groundforce in support of civil engineering contractor George Leslie. The specialist supplier of piling equipment provided a ICE328B Free Suspended Vibratory hammer and ICE100 power pack free of charge for George Leslie to erect the 23m-long jetty at the It’s Good 2 Give Ripple Retreat – a stunning purpose-built three-bedroomed respite centre on the banks of Loch Venachar in Loch Lomond and Trossachs National Park. The jetty on the 6km-long freshwater loch is constructed of greenheart marine-grade timber but that is all that has been usual in a project for George Leslie who are specialists in marine engineering. The Piletec Vibro hammer was selected over a pile/impact hammer for two reasons. Firstly, the make-up of the loch bed, which is 33m deep at best, was unknown so it was deemed a vibro hammer would be the less invasive, safer option. Secondly, the greenheart timber piles were only 170mm square, and although this timber is very dense and solid, an impact hammer could have split this small section of timber pile during the piling operations. The last project George Leslie used greenheart timber on was for new tanker berths on the River Clyde where the piles were three times as big at 540mm square! The relatively small size of the timber piles at the Ripple Retreat also required a bespoke pile driving hydraulic clamp – a metal cap which George Leslie fabricated themselves to prevent damage to the timber pile. Installing the jetty took four weeks. In total, 44 eight-metre long timber piles were sunk 3m into the loch bed by the 1.5 tonne hammer, each taking between 2.5 and five minutes to drive to the required design depth. These were then cut down flush with the jetty walkway. The Piletec Vibro hammer was also used on four 9m long 12” x 12” temporary steel beams which were sunk into the loch bed to guide and support the timber piles at two points above and on the water line while they were vibrated into place. The two steel beams furthest into the loch were then moved inside the other beams as work progressed down the jetty towards the shore. This was in three main sections, using a 60-tonne crawler crane to wield the hammer driven by the Piletec power pack on the shore. The Ripple Retreat, on a site donated to the charity It’s Good 2 Give by private landowners David and Jean Ferguson, is so called because award-winning international architect Tony Kettle, who also designed the Falkirk Wheel, was inspired by the ripples on the loch. Roofed in zinc and clad in glass and iroko, it has three bedrooms, a caretaker/companion’s room, kitchen, playroom, dining room and lounge.